Thunderbolt Global Logistics in the USA are pleased to share a video (click to view) of a 113tn industrial press component moved from the Port of Portsmouth in Virginia to Union in South Carolina. The shipment, arranged by Thunderbolt, consisted of the lower bed of an industrial press with dimensions of 8.20 x 3.95 x 3.96m. 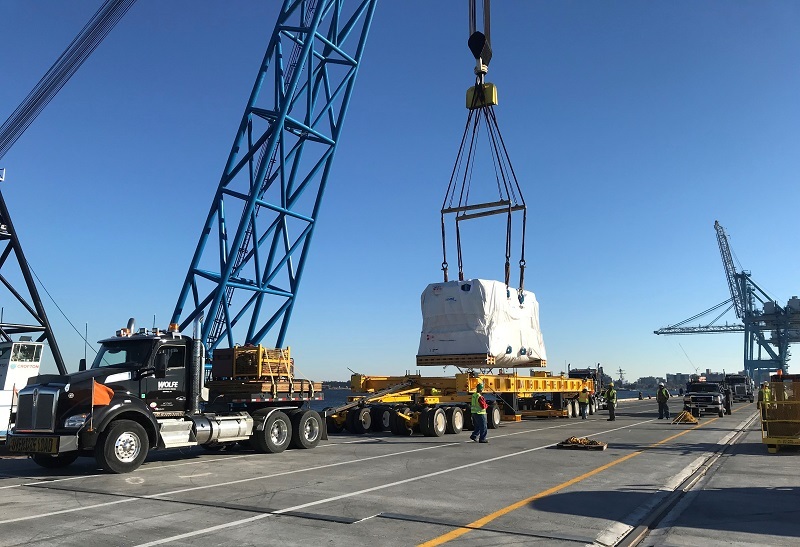 After months of planning, the piece was picked up at the Port of Portsmouth (VA), using a special shore crane which was hired to lift it onto the truck, and delivered to Union (SC) three days later in perfect condition. The move could only take place at night from Portsmouth to the North Carolina border and only in daylight hours through North and South Carolina. A great job successfully and reliably handled by Thunderbolt Global Logistics!